2.22 mi. ; from DC line northeast to MD 410. MD 500, shown on maps from 1942 and 1952. MD 210 became part of 500. The District line is visible at bottom left. 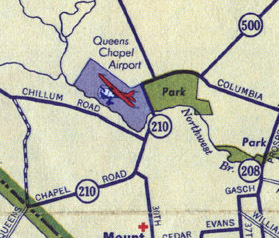 Queens Chapel Airport has long disappeared, and would be well nigh impossible to be there in today's world of the DC ADIZ and FRZ. 1.68 mi. ; from MD 212 east to MD 500. 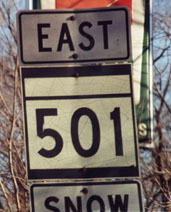 MD 501 marker (photo 02-18-2001). from MD 366 south to Virginia state line. Was once the closest route to the southeast corner of Maryland near Sinepuxent Bay. 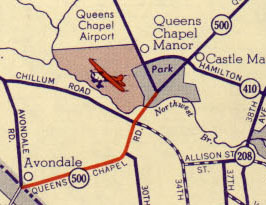 MD 502 shown on a 1958 map. No longer assigned (decommissioned), Rousby Hall Rd portion of this route now part of MD 760. We now come to a cluster of routes in Calvert County (503-512). south off Rousby Hall Rd (then MD 503, now MD 760). No longer assigned (decommissioned), entire route now part of MD 760. 3.79 mi. ; from MD 2/4 west to MD 508. 1.20 mi. ; from MD 231 south to MD 506. MD 508 once went further south to Adelina, but was rolled back to form an L intesection with MD 506. 0.95 mi. ; from MD 2/4/765 east to dead end. northwest off MD 524 to MD 262.
southwest off MD 264 to road end. west off MD 264 to road end. 1.77 mi. ; from Bus US 13 east to past US 13 (Salisbury Bypass) interchange at Jackson Rd. from DC line north to MD 410. No longer assigned (decommissioned), entire route now part of MD 320. 4.89 mi. ; from MD 298 southeast to MD 20.
from Sligo Ave (former MD 391) southeast to MD 384.
from MD 193 west to US 29.
old number for MD 136 from MD 23 east to MD 24. No longer assigned (decommissioned), entire route now part of MD 136.
from Bus MD 404 north to road end. Unmarked, may be decommissioned . from Dover Rd northwest to Garrison Forest Rd. No longer assigned (decommissioned 1955-1976, 1980-present).